For central connect devices via Insight Remote Support (RS), you have correctly installed and configured Insight RS, entered your HPE Passport credentials to register for Insight Online, and specified your HPE Authorized Channel Partners in the Hosting Device Setup Wizard. Note: When using Insight Online, each HPE Passport ID can support a maximum of 1,500 devices. Make sure the sum total of monitored devices does not exceed 1,500 devices, even when the HPE Passport ID is used across multiple Insight RS clients. Additionally, during unusually large demands on Insight Online, you may see performance lags with HPE Passport IDs that support more than 1,200 devices across multiple Insight RS clients. For central connect devices via OneView Remote Support, you have correctly configured Remote Support within OneView, entered your HPE Passport credentials to register for Insight Online, and specified your HPE Authorized Channel Partners in OneView Remote Support. For direct connect devices, you have registered using the iLO or OA interface, and completed the registration process in Insight Online. 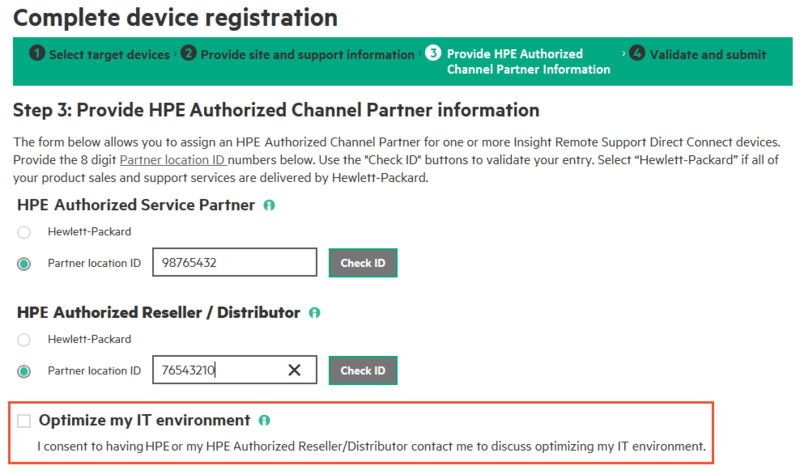 The registration process in Insight Online includes specifying HPE Authorized Channel Partners. Another user in your company may have completed this registration process, and shared the contract and warranties or devices with you. In that case you will see the devices. For detailed information about setting up ProLiant Gen8/Gen9 servers and BladeSystem c-Class enclosures, see the HPE Insight Remote Support and Insight Online Setup Guide for HPE ProLiant Servers and HPE BladeSystem c-Class Enclosures at www.hpe.com/info/insightremotesupport/docs. For detailed information about setting up ProLiant Gen10 servers, see the iLO 5 User Guide at www.hpe.com/support/ilo-docs. The central connect method are visible without any action on your part. Select the Insight Online My IT Environment tab. The Complete device registration page appears. Select one or more devices, then click Next. You can complete registration for multiple devices at one time if they share site, contact, and channel partner information. If your support provider is HPE, accept the default settings. If your support provider is an HPE Authorized Channel Partner, enter the partner location ID. Click Check ID to verify that the correct partner is selected. Choose Optimize my IT environment setting. Note that for direct connect devices this action only applies to the specific devices you select. Note: If you choose to have a channel partner manage your devices, select this option to allow the partner to see configuration details for the devices. See Enabling access to customer’s device information for details. By checking the box labeled I consent to having HPE or my HPE Authorized Reseller/Distributor contact me to discuss optimizing my IT environment you agree to allow HPE or your HPE Authorized Reseller/Distributor to access your collected configuration information and contact you with recommendations to purchase additional hardware and software products to optimize your IT environment. These providers may be located in other countries than your HPE IT hardware location(s). HPE Authorized Resellers/Distributors are required to keep information received from HPE confidential and may use it only for the purpose of providing advisories and recommendations on behalf of HPE. To withdraw your consent, clear the box labeled I consent to having HPE or my HPE Authorized Reseller/Distributor contact me to discuss optimizing my IT environment. Note: Only the HPE Authorized Resellers/Distributors and Authorized Service Partners you associate with your devices can receive your configuration data to individually contact you to make IT environment recommendations, sell or deliver solutions. This setting can be updated at any time. See Edit service information. Click Next. The Validate and submit page appears. You are prompted to continue and to optionally provide an email address to receive a notification that the batch process has begun, and a notification when it has completed. Use the batch process name to look up the status of the process in your Message log. Devices in the list are grayed out if you do not have administrative privilege to modify them, or if they are part of a current batch process submitted by you or another user. When you receive the email saying the batch process is complete, you can click on the refresh devices button to remove the devices included in your batch process from the list, and to update the count of unregistered devices on the dashboard. The email notifications contain summary status information and a link to your message log which contains more details. The submission occurs interactively and the result appears on the next page with status about registration and about contract and warranty linking. When you complete registration, if you provided partner information and selected to have your IT environment optimized, the partner will be able to view and manage your devices from the My Customers tab. For more information, see HPE Authorized Channel Partners. By group. See Edit service information. Primary and secondary support contacts must be different. Once you have completed registration of direct connect devices, you can edit the devices' site, support contact and partner information as a group. Option 1: On the My IT Environment page, click My IT Environment > Dashboard > Edit service information. Option 2: On the My IT Environment page, click My IT Environment > Devices > Edit service information. Select target devices whose information you want to change and click Next. Only direct connect devices that you have administrative privileges to modify are listed. Edit service information. Edit site, primary and secondary service information and support contact information. Select an HPE Authorized Channel partner. 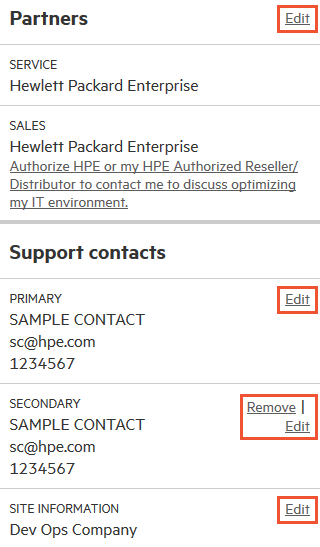 You can select HPE or if you select a different partner, provide that partner's location ID. Choose Optimize my IT environment setting. Validate and submit the new information. You are prompted to continue and to provide an optional email address to receive a notification when the batch process has completed. Devices included in a batch process submitted by you or by another user remain in the device list but are grayed out. When you receive the email notification that your batch process is complete, you can click on the refresh devices button (Refresh devices) to return the devices included in that process to their normal state. The email notifications contain summary status information and a link to your message log. Use the batch process name to look up the status of the process in the message log. For central connect devices, you must change this information in the Insight RS Hosting Device user interface.